With an alluring pair of eyes set upon a perfectly shaped face, Palina Tsehalka will gaze upon anybody and leave a lasting impression. Beware, they say, for a pair of irresistible eyes can spawn a love affair that could last a lifetime. It seems that weeks after the Miss International 2016 has been settled, Missosology’s pageant expert’s love for Miss Belarus Palina Tsehalka is far from over. They gazed upon her eyes, then fell in love and now, there is that compelling question left unanswered: why was she left out of the Miss International semifinalists? Total head turner! Palina during the opening party and VIP dinner. Palina has been described as someone with jovial personality and her wardrobe collection was perhaps the best in recent history of Miss International. Her aura is full of glamour and echoes the spirit of Hollywood. If anyone that can bring the second major international crown to Belarus, it should be Palina. At the final hot picks of Missosology, Palina Tsehalka rounded off the Top 10 and our beauty experts pointed out her impeccable personal style and her amazing wardrobes. If only she were there in the semifinals, she could have been one of the Top 5. So why exactly she was left out? Palina was an extraordinary candidate but with a rather ordinary sash. If we are to talk about her beauty, body and overall aura, she is topnotch. Her fashion sense, as mentioned, was very much eye-catching. She is also conversant with the English language and she even became the interpreter for Miss Moldova in many cases. Clearly, during the fora and conversations with VIPs, Palina was never left behind. Palina during the national costume presentation. Indeed, the only angle that beauty analysts can see was that Palina wore an ordinary sash. Belarus, despite having one major international crown, is not a beauty powerhouse, nor is the country well known in Japan, where Miss International is based. The country is basically absent in two of the five major international beauty pageants. No one could associate with Belarus with beauty pageant prowess and politically, its image is tarnished by the label as the last dictatorship in Europe. Sad but true, the sash weight of the candidate can affect her chances. Palina Tsehalka is a victim of this phenomenon. Some pageant experts suggested that had Palina say, carried a Russian sash, she could have made the cut. Missosology already described Miss International as a very unpredictable pageant. 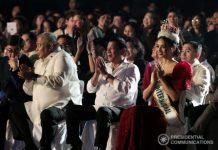 But despite the nature of its unpredictability, the exclusion of Palina at the semis was something that completely caught the pageant experts, and even some of the Miss International staffs, off guard.